The little seaside village of Manuel Antonio serves as the entry to the lush tropical rainforests of the Manuel Antonio National Park. The richly biodiverse park teems with hundreds of species of resplendently exotic bird life, endangered primates and fascinating sloth bears. The coastal village seems to have it all – emerald green forests, aquamarine coral reefs and miles of white sandy beaches. Tranquil waves lap upon its shore, as cozy beach shacks and seaside cafés sit quietly along the coastline. Often the beachcombers to be found at the village are the capuchin monkeys from the National Park. This little village is as much for wildlife enthusiasts as it is for travelers looking for a serene vacation, far from the hectic crowds. Arenas del Mar Beachfront & Rainforest Resort, barely ten minutes away from the Manuel Antonio National Park, is set on a cliff overlooking the Pacific Ocean. 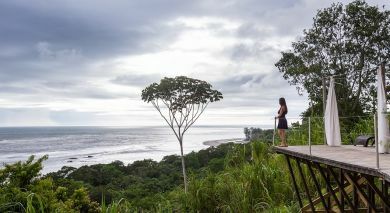 Parador Resort & Spa is tucked into a tropical rainforest right by the Pacific Ocean at Manuel Antonio. Enjoy a cozy stay amid antiques and art pieces at this Spanish villa-inspired resort. 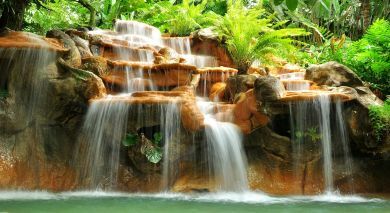 Hotel Plaza Yara is located barely 10 minutes away by car from the Manuel Antonio National Park entrance. Althought not located beach-front, this boutique hotel is set among quiet tropical gardens. Si Como No Hotel & Wildlife Refuge, set on a forested hillside overlooking the Pacific Ocean, offers you a comfortable stay in Manuel Antonio. 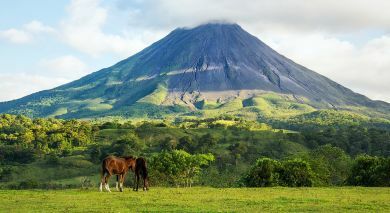 Experience an adventurous horseback ride through the lush rainforests of the Manuel Antonio National Park. After breakfast at your hotel, drive down to Londres with your local guide. Discover a lovely estate, complete with stables and a corral, awaiting you at the trailhead of Londres. At an outdoor space, go over safety routines and riding instructions with your guide, before riding off into the jungles. This horseback trail follows a highland route with great photo ops over panoramic valley views and forested landscapes. Watch out for flocks of exotic birds and other wildlife along the trail. Mid-way into the trip, take a half hour break to stretch your legs by a gorgeous waterfall. Lounge by the grassy poolside or take a plunge into the stream. Ride back along the same trail. At the end of your horseback safari, relish a delicious lunch prepared with fresh local produce, over good conversation with your friendly hosts. Drive back to your hotel after lunch. (Full Day; Time of Day: Morning; Duration: 5.5 hrs; Private Activity & Transfer; Meals included: Beverages & Lunch/ Dinner; Fitness Level: Moderate; Please bring comfortable hiking shoes, covered clothing, sun hats, sunscreen, sunglasses, insect repellent & bathing suit; don’t forget your camera; Note: Children below 8 will need to be accompanied by an adult; a bilingual guide will be provided for you). Get ready for an adrenalin-pumping canopy tour over lush rainforests as you swing by on zip lines, walk over suspension bridges, and fly on a classic Tarzan swing. Imagine gliding over an emerald paradise, whizzing past birds and treetop creatures. Before staring the tour, go through a safety training on zip lining procedures with your instructor and guide. The canopy trail is fitted with a hanging bridge, a Tarzan swing, multiple zip lines and rappel lines that crisscross the thick tropical jungles beneath your feet. The tour also has numerous observation platforms with spectacular panoramic views and photo ops. Walk over to the Butterfly Garden after your canopy safari, and watch the fascinating journey of a pupa to a resplendent butterfly. Stop by the huge glass enclosures of an equally fascinating snake exhibit that houses various species. After an adventure filled day, refresh yourself with snacks and a sumptuous lunch at an on-site restaurant. (Half Day; Time of Day: Morning; Duration: 4 hrs; Private Activity & Transfer; Meals included: Beverages & Lunch; Fitness Level: Moderate; Please bring comfortable hiking shoes & sunscreen; don’t forget your camera; Note: Security equipment & bilingual guide). Enjoy a snorkeling and kayaking trip along the beautiful coastline of Biesanz Bay. Take a half hour drive down to Quepos pier with your local guide. Set off in your kayaks for the lovely inlet of Biesanz Bay, drifting past tiny islands and flocks of water birds roosting by the waterside. Make a half hour pit stop at Biesanz Bay, stretching your legs and catching refreshments. Go snorkeling and explore the rich marine life by the bay. If you’re lucky, you’ll spot parrotfish, starfish, angelfish, and even elusive sea turtles! Paddle back to Quepos pier, watching out for flocks of pelicans, flying fish, and other exotic sea creatures on your way. Leaving your kayak behind, relish a delicious homemade lunch over conversations with your local hosts. (Half Day; Time of Day: Afternoon; Duration: 4 hrs; Private Activity & Transfer; Meals included: Beverages & Lunch or Dinner; Fitness Level: Hard; Please bring sunscreen, sunglasses, sun hat & beach towel; don’t forget your camera; Note: a bilingual guide will be provided for you). 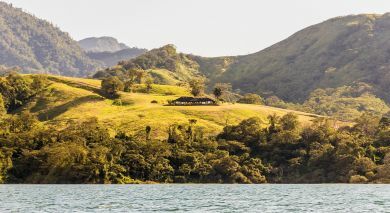 Experience a fascinating whale watching day cruise at the beautiful Marino Ballena National Park. Set off from Manuel Antonio on an hour’s drive to the park, which stands near the village of Uvita by the Pacific Coast. Learn about the cultural and natural history of the region from your local guide, as you pass by the lovely beaches of Dominical, Playa Matapalo, and Playa Uvita along the way. Once aboard the cruise boat, sail down the Pacific Coast in search of whales and schools of dolphin. Sail by the iconic natural landmarks of the Roca Ballena and Las Cavernas by Playa Ventanas. Look out for the natural rock system of the Roca Viuda and Tres Hermanas. Catching sight of wildlife in their natural habitat is always a matter of luck! If you’re lucky enough, you’ll spot dolphins, pilot whales and humpback whales. (Full Day; Time of Day: Morning; Duration: 6 hrs; Private Activity & Transfer; Meals included: Snacks & Beverages; Fitness Level: Easy; Please bring sunscreen, sunglasses, sun hat & beach towel; don’t forget your camera; Note: This tour is only available between mid-Jul & mid-Oct; a bilingual guide will be provided for you). Discover the natural wonders along the Tárcoles River on this adventurous boat trip. Enroute to or from Manuel Antonio, take the opportunity to track crocs on the Tárcoles, one of the main rivers flowing into the Nicoya Peninsula. The Tárcoles River houses one of the biggest populations of wild crocodiles around the world. Your boat ride also brings you bird spotting opportunities, including elusive scarlet macaws and waterfowls. Look out for water-walking lizards and iguanas as you drift along the river. Sailing downstream, reach the mangrove forests of Estero Guacalillo, featuring various species of mangrove trees. Continue on your journey, after your boat trip. (Half Day; Time of Day: Morning; Duration: 2 hrs; Private Activity & Transfer; Meals included: Fruits; Fitness Level: Easy; Please bring comfortable clothes & shoes, sunscreen, sunglasses & sun hats; don’t forget your camera; Note: Water & bilingual guide will be provided).